We have been keeping a close eye on our neighbors to the West of us and how they will handle an ordinance proposed by the Santa Ana Collaborative for Responsible Development (SACReD). As reported in the Voice of OC, SACReD sponsored an ordinance that would create a new level of transparency in government. Santa Ana politicos have long lamented the secretive world in which the Santa Ana City Council often conducts business. In past years, they have been accused of scores of Brown Act violations as well as running roughshod over small businesses and the resident artist community alike. While much of what SACReD asked for in their proposed ordinance is the subject of state law already, we can see their issue with a city council that has declined to work interactively with the community at large. Also at issue is how willing the Orange County District Attorney has been willing to investigate and prosecute violations of the Brown Act and other regulatory laws, particularly when those being investigated claim Republican Party affiliation. However, one part of the proposal has to do with lobbyist registration which, along with the publishing of each councilmember’s calendar, would have opened up the secretive bed in which lobbyists and the politicians they attempt to influence to public scrutiny lie. Not a bad thing in anyone’s book, unless you are a lobbyist or an influenced politician. City staffers have been sent back to work on the ordinance including the changes the city council and SACReD agreed upon. That should happen in a couple of weeks. It is likely to be a watered down version of the original proposal, but it is a start. By coincidence, or perhaps by karma, a proposal to shed more sunshine on the business of the Tustin City Council was also introduced on the same evening as Santa Ana’s proposal. In this case, the issue was raised by Councilmember Deborah Gavello, who asked her colleagues to consider agendizing discussion of a proposed policy or ordinance on lobbying. Gavello read a short piece on ethics in government to support her position for an anti-lobbying ordinance. She mentioned that the City of Irvine has a strong policy on ethics and lobbying. In speaking with Gavello on this, she said that she is concerned about the lack of policy on ethical behavior and the possibility that some former councilmembers have -or could- come to a sitting councilmember and, because of their former position, immediately lobby for their interests. We agree this is an issue worthy of consideration by the city council and that it should also include lobbyist registration and the publishing of councilmembers’ official calendars. John Nielsen, in an apparent move to obscure the issue, mentioned that the strategic planning coming up in October had an ethics component. He was concerned that, by agendizing an item as Gavello wanted, they would be requiring the staff to cover ground twice and addressing the issue in bit and piece fashion would not be to the benefit of the city (we’ll spare you the cost-saving remarks our fiscally responsible mayor made). I think the gist of what Deborah is trying to do, and I could be wrong but, is maybe to encompass that with the strategic plan, that we are considering that policy, that ordinance, I’m not sure what she brought forward. I agree with you that we should not be duplicating effort but, that it would be incorporated into what we’re doing. Gavello, saying that she doesn’t trust “us”, said she does not see the strategic plan coming back with an ordinance. Saying that the strategic plan does consider ethics, lobbying is not mentioned at all and that is why she felt it needed to be brought forward for consideration by the council. Of course, Jerry can’t pass up any opportunity to hear himself bash Deborah so Hizzoner goes on about how the two ways to get an item agendized is either to discuss it with the mayor and city manager or to make a motion and obtain a second for a vote. Uh, didn’t she just do that? We’ll get back to that statement later. Thanks to Gomez, the vote was not a complete wash. Unfortunately, the Three Amigos voted together and the city attorney, when questioned by Gavello as to the rules regarding having something agendized, backpedaled into the three on the right sputtering, “It is not against the Brown Act to vote to agendize an item.” That’s not what she asked, of course, but it was enough of a sidestep by David Kendig to keep him firmly entrenched with the boys. So, there will be no sunshine in Tustin, at least as long as the Three Amigos are holding the ball. Does that mean that Tustin does not deserve a sunshine ordinance? Aside from what Hizzoner Amante ranted about, the state law is vague on local government lobbying. In fact, there is very little written about it and there is, unless local ordinance or policy specifically prohibits it, little to prevent a former councilmember or city staffer from immediately lobbying members of the council as well as the members of boards such as the Orange County Transportation Authority, Orange County Fire Authority or the Transportation Corridor Agencies on which they may have served. It doesn’t hurt that the Orange County District Attorney shies away from investigating political violations and the vagueness of current law is often used as an excuse not to investigate. 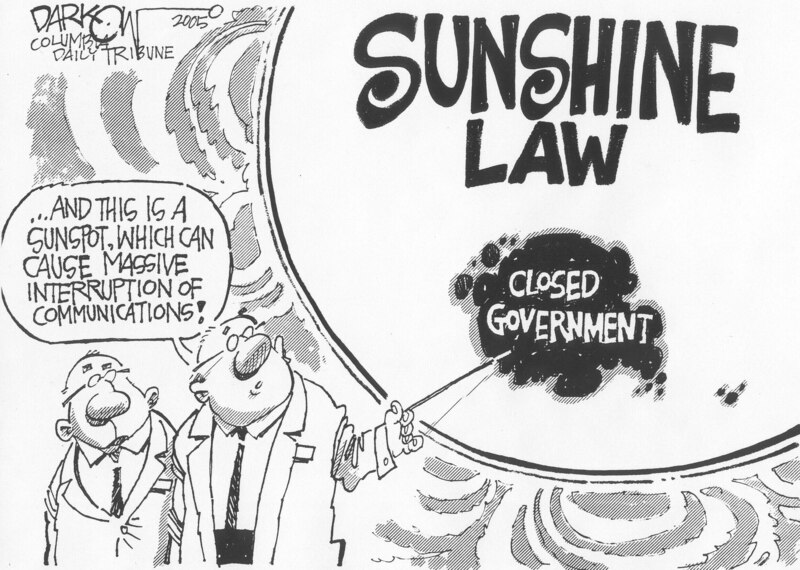 Sunshine laws, such as the one Santa Ana is considering and Councilmember Gavello asked to be agendized for consideration by the Tustin City Council, are effective in insuring that the citizens whom the city serves are kept informed and aware of issues affecting them. This goes much further than simply posting an agenda or the financial report on the city website. It goes further than having the public information officer post pictures of city events and contests for the kids on the city’s Facebook page. It has to do with, as Gavello says, ethical behavior by those who are supposed to serve the city. It goes to trust of a city council and staff who often have a difficult time treating citizens without disdain, let alone their colleagues on the board. And yes, Jerry, it has to do with you. Let me begin by addressing the misstatement by Councilwoman Gavello, so we clear the air. All the time you have been serving on the council, councilwoman, I have been practicing law, not lobbying. I joined FSB Core Strategies July second. I don’t lobby in the county. I don’t lobby any of the agencies I belong to. I, uh, follow the rules just as they have been written in state law. So, you have no basis to make scurrilous remarks. GOVERNMENT RELATIONS – The firm provides strategic consultaion [sic] to clients with matters pending before government bodies or regulatory agencies. It represents clients before local, regional, state and federal governments and agencies. It specializes in the negotiation and presentation of complex matters for its clients and it frequently consults with other firms to assist them in their strategic planning for their clients. It is dedicated to the success of client projects and in zealous advocacy for them. It has particular expertise in land development, financing, construction and the like. I don’t think you could get a more precise definition of lobbying if you looked it up in Webster’s Dictionary. And, while I won’t go as far as to say he has lobbied other Tustin councilmembers on behalf of his clients, others seem to think he has. Somehow, we think this issue is not dead. There is that so-called “strategic plan” coming up for discussion. And, there will be a changing of the guard in November. Worse comes to worse, when Tustinites actually do get fed up with the dismal track record of their elected officials, this is a prime candidate for a ballot measure. In the meantime, thanks largely to the Three Amigos on the city council, Tustin will remain dark. Posted on September 25, 2012, in In the News, Local Government, politics, Tustin City Council and tagged Brown Act, Carlos Bustamante, conspiracy theories, deborah gavello, ethics in government, john nielsen, strategic planning, tammany hall, transparency in government, Tustin City Council. Bookmark the permalink. Comments Off on Ain’t No Sunshine in Tustin.